First, do you create a Community Team or create the mechanism to support one? That is the chicken & egg scenario that Golden & Area A faces in Spring 2015. While there has been interest in developing, aligning and strengthening, the non profit sector in Golden & Area A since 2010, formalizing that sustainable structure has been challenging. To further challenge the sector, there has been minimal political interest in supporting a Community Team. After a presentation by Jill Zacharias, City of Revelstoke's Social Development Coordinator, there was a proposal to allocate some funding from the cancelled Grant in Aid program ($22,500) from the Town of Golden for a similar position. However, this concept was not moved forward during the last Council's term and the current Council has in fact re-allocated $20,000 back to a Grant In Aid program. 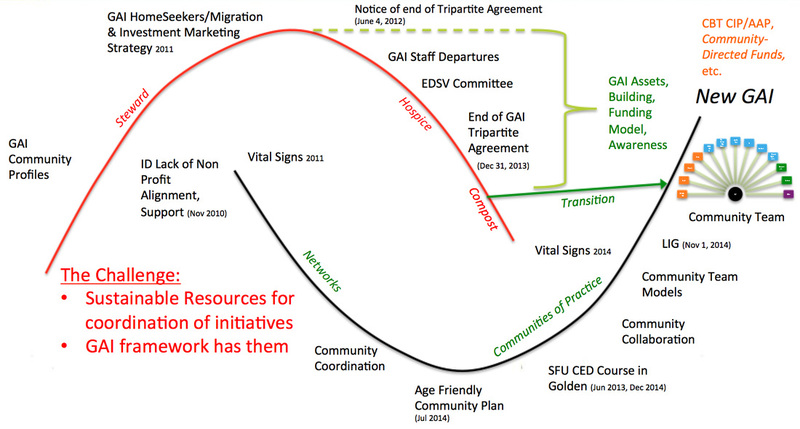 By way of a Simon Fraser University Community Economic Development course hosted in Golden in December 2014, there has been considerable interest in the "Constellation Model" concept and applying that to local community groups and projects. There is already an Early Childhood Development Coalition (ECDC), an Age Friendly Community Plan, Committee and Coordinator, and ongoing discussions among Trails, Faith-Based, Education and Sports & Recreation organizations. There is also plans underway for bringing local youth-focused groups together to discuss opportunities, overlap, sharing, results and alignment. All of these activities are leading the community's organizations towards formalized constellations and, ultimately, a Community Team. However, at the end of the day, and for many reasons outlined in this project, a Community Team needs to be supported - to some extent both financially and politically. Maybe this group/team needs to be appointed by Town of Golden & CSRD Area A jointly? Regardless of how they get there, a "cross-sectoral board" model needs to have "sub-sector" representation, with reps from Health & Social Services, Youth, Business Organizations, etc. And this Team needs to be supported by staff. Constellations and a subsequent Community Team help pull together people and organizations toward common goals. Their increased awareness of shared activities leads minds toward shared use of resources and success. For these individuals and organizations to be committed, they need to feel respected and valued in a decision-making or advisory capacity. If they are not valued, you may end up with the wrong people. There is little 'teeth' to a Community Team without resources and the easiest resource to measure is money. New GAI funding for operations can be found through an old method - taxation from local, regional and/or EOF. Having the Community Team allocate funds to community projects would provide a reason for being, and being better. Creating a well-meaning community development body is one thing. Building in accountability is another. The permitted allocation of tax dollars v. public funds v. CBT's CIP/AAP funds will have to be explored in great detail. Which type of funds are restricted to the use of elected officials and which are not? What management controls will need to be in place to ensure that funds allocated by a Community Team built community and trust? Community Team-allocated funds could include CBT's CIP/AAP funding ($283K/yr); CBT Community-Directed Funds ($200K/yr); and even possibly Grant In Aid programs from the Town of Golden ($20K/yr) and CSRD Area A ($66K/yr). The strategic allocation of $500K/yr (v. the tactical way it is currently being allocated) can make a significant impact in the development of Golden & Area A. Add the "multiplier effect," where Golden's Community Team members (including grant writers and fund developers) are working to leverage these funds further, and there is a very compelling motivator for coming together. FSG, leaders in mission-driven consulting, "supporting leaders in creating large-scale, lasting social change," have developed a "Collective Impact" framework, which is more rigorous and specific than collaboration among organizations. The Community Team is an example of a collective impact project because it is more than just collaboration - it is a new system. Measurement is the key to the execution and reporting of any plan. Community Team members are well-positioned to naturally report "up and down stream" to their 'groups of groups' and individual groups, which touch every resident. A Community Team IS a diverse set of stakeholders, across sectors and coordinated, through a mutually reinforcing plan of action. With 'coalition meetings' already underway and regular feedback moving up and down to the Community Team, trust will be built and mutual objectives achieved, whether it be for community, economic, social or environmental goals (all leading back to an ICSP). As well-meaning as they may be, a volunteer-supported Community Team will not be successful without an independent, funded staff dedicated to the initiative. CED is by definition, inclusive of multiple aspects of a community, including economic, social, environmental. The long-term strength and sustainability of the CED organization comes from it's collaboration with the existing community groups and systems. The longevity of a CED organization is dependent upon their support and execution toward common goals. CED organizations need to be inclusive and collaborative. The more that a CED organization is isolated, the less they will be performing mutually reinforcing activities. Contrary to isolated CED/EcDev operations, sustainable CED organizations work and communicate in a structured way with all stakeholders. Local & regional governments have experience with shared service agreements and tripartite agreements, which are entered into to created guide "the initiative’s vision and strategy, supporting aligned activities, establishing shared measurement practices, building public will, advancing policy, and mobilizing resources." 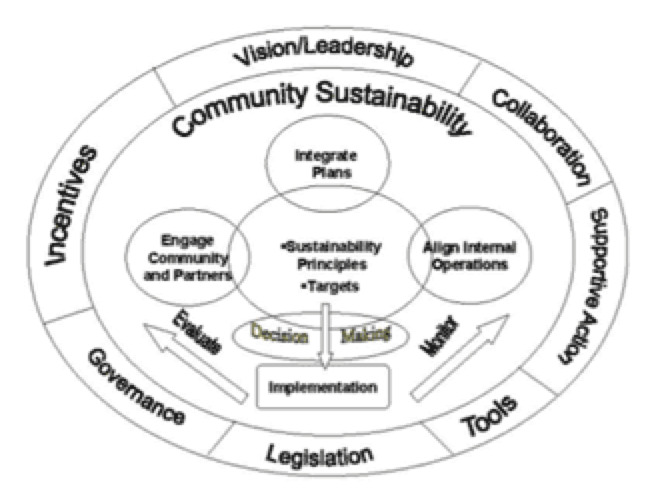 FSG's "Common Agenda" is an analogue to a "Shared Vision" from Surman's Constellation Model. And "Backbone Support" is very similar to the funding, terms, agreements that make Surman's "Stewardship Group" possible. The governments of Golden & Area A would be on the right track to collective impact if they were to conditions for a Common Agenda/Shared Vision and Backbone Support/Stewardship Group. From both local and regional history, it appears that sustainable Social Development (SD) support will be very challenging. And even by working on Social Development, it still leaves Golden & Area A with a CED gap. 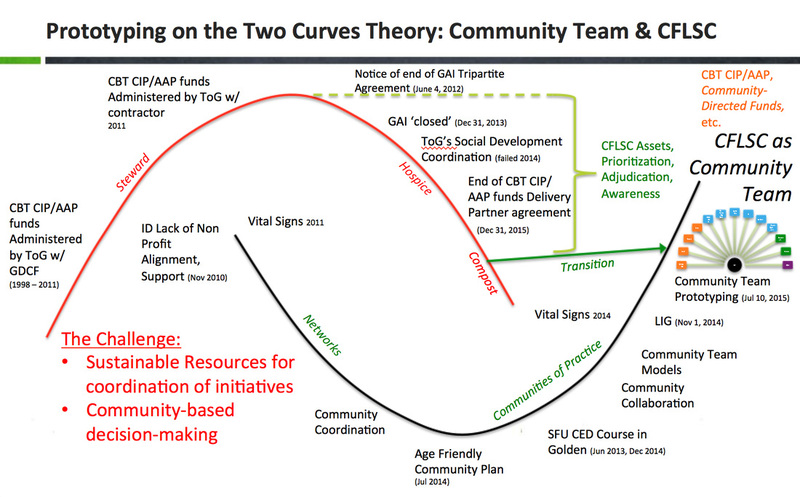 While local government is on track to dismantle Golden Area Initiatives (GAI), it is worth looking at how GAI can be used to create the new support system of community development in Golden & Area A before assets. Beginning in 2009, dissatisfaction with GAI has become more formalized as the Town of Golden commissioned a report to look at the effectiveness of their funding. Many steps and events followed and at the end of 2013, funding for GAI was formally ended. In 2010, local non profits began to look at their efficiencies. After discovery how many groups were in the community of 6,766, efforts were put towards helping them communicate among similarly-focused groups. Over time, with visits from experts and a benchmarking trip to Jasper, AB, the goal of a Community Team was identified to ensure that all community development stakeholders could work together as a stewardship group. However, this initiative and Mayor Benty’s ‘social development coordinator’ position has stalled without adequate political and operational support. Therefore, it makes sense to look at solving both SD and CED challenges together through an integrated plan. The Life Cycle of Emergence diagram below is comprised of two curves, one declining (left) and the other emerging (right). This model was built by Meg Wheatley and Debbie Frieze (Berkana.org, 2006). Over time, any organism or system grows, peaks and begins to fail until it reaches state of hospice and eventual death. GAI has gone through that cycle, while the Social & Community Development groups in Golden & Area A have developed a new, emerging system. The community has the opportunity to transition the assets, funding model and awareness that GAI had into a new system or organization that can leverage them. Otherwise, they will be lost or sold (as in the case of the BCVC building) and proceeds swallowed by both local and regional governments. The Golden & Area A community - or any community - has the opportunity to help transition a failing "System of Influence" into a new, emergent "System of Influence." Currently, that challenge lies with a GAI and a Community Team. In the future, the surrounding environment or internal processes may change enough into a definable "Future Opportunity or Challenge" that may need "illuminating" by a new, emergent "Community of Practice." And so the cycle continues, producing a better-equipped community over time. Empowerment is key to engaging community members, community groups and a Community Team. Conversely, any public funds allocated for this purpose must be used responsibly in an open and defensible way. 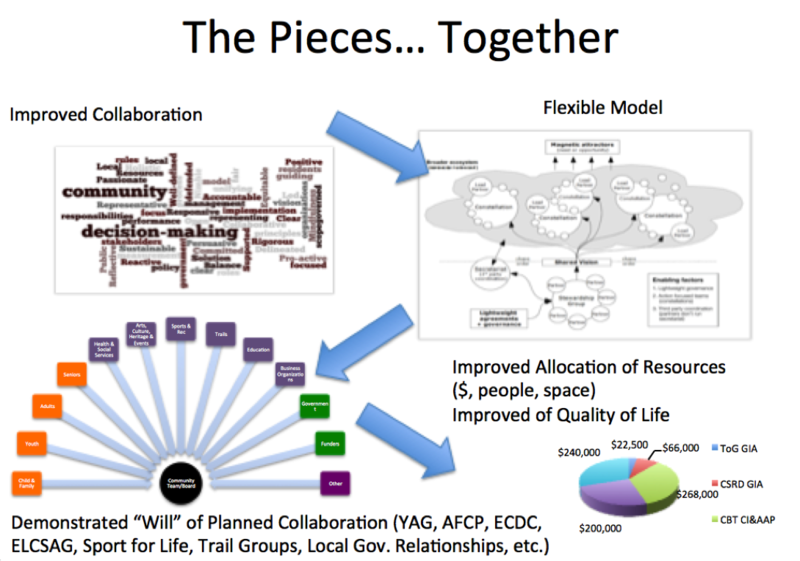 One version heavy on the accountability side, is this model below, which utilizes Golden Area Initiatives (registered as Golden Area Community Economic Development Society, GACEDS). GAI was originally joint-funded through a tripartite agreement using Town of Golden & CSRD A funds. While that agreement has ended, the assets of GAI still need to be dealt with. One significant asset is the BC Visitor's Centre @ Golden (BCVC@G). Normally, the assets of the Society would be sold and proceeds divided equally among both the local and regional government. At this time, with minimal commitment from the major tenant, it would not likely fetch a significant price. However, as there is still a desire by local government to do some sort of community economic development (CED), so why not retain this organization and the assets it maintains? Why not use the core GACEDS organization to host and support the stewardship group, the Community Team as it works on a Shared Vision and supports many existing Constellations (see Surman's Constellation Model for more details). 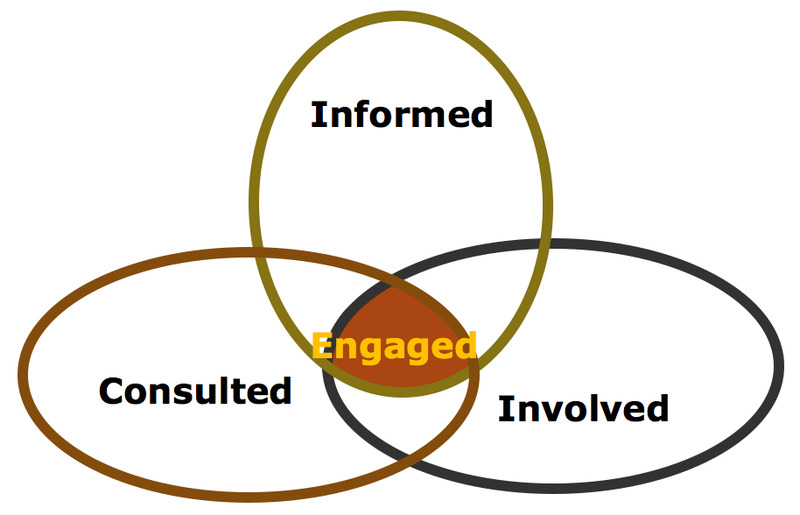 Community members (and Team members) must be informed, involved and consulted before they become truly engaged. 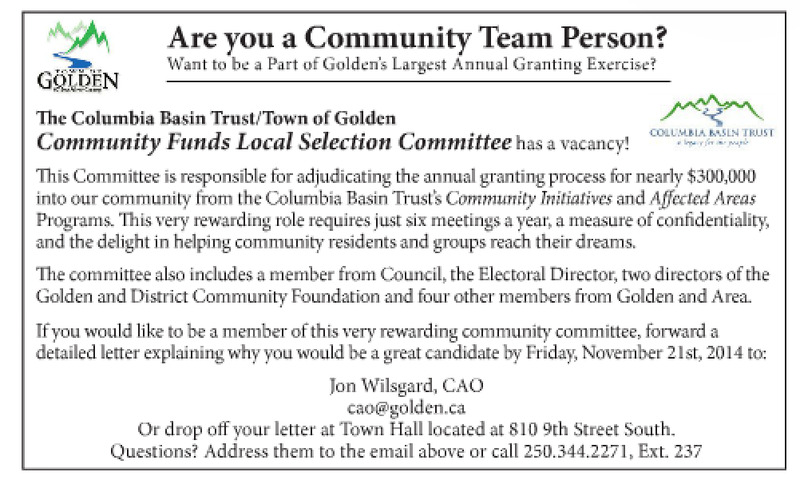 Jon Wilsgard, CAO at the Town of Golden, used the "Community Team" language when requesting applications for the CFLSC. This is an example of a bridge between the current CFLSC and a future Community Team that could take its place. With the new ad, new four citizens were attracted, sending in applications to the Town. In November 2014, new members, with a specific sub-sector expertise and a community-minded lens, were appointed to the CFLSC. In order to capitalize on this opportunity to sustain CED and a Community Team, funding and support from both local governments (Town of Golden & CSRD Electoral Area A) is required. In the past tripartite agreement for GAI, joint funding ($85,000 per year by each government via taxation + $100,000 in EOF to be paid by the Regional District = $270,000) came through semi-annual contributions. (This model is be similar to Revelstoke, where “the CSRD contributes approximately 35% of the EDO’s annual budget, yet represents just 10% of the area population.”) This amount does not include the Town and CSRD each allocating $60,000 to Kicking Horse Culture and $7,000 film commission related work. The Town of Golden would prefer to re-form a "Standing Committee" that could govern the organization (see Figure: GAI 2.1 Concept below), and direct a future EDO. The EDO would then support many other current and future committees (Community Team) - with or without current guiding documents like an Official Community Plan (OCP - Town of Golden), Capacity Building Rural Development Plan (Area A) or an Integrated Community Sustainability Plan (ICSP). Proceeding with this strategy would basically replicate the system that led the local government ending funding for in December 31, 2013. The only difference would be involving more people on the Standing Committee (7 from Town of Golden - all elected officials; with another 7 or less from Area A's Director's Advisory Committee or citizens at large) - there would not be any meaningful representation from community organizations. One argument, from the funders perspective, against this alternative is the minority influence local government would have on the organization and it's assets. Ease of management - basically duplicating the former GAI structure with 4 Directors (Town of Golden's Mayor & CAO and CSRD's CAO & Area A Director) and a appointed Board comprised of local volunteers. Does not address the challenge of a political board and disempowered Board of appointed volunteers. Does not reduce complexity - in fact, it adds either 1) another level of decision-making between elected officials and new existing community committees, or 2) a further disconnect between addressing community issues and the resources that are typically awarded to the local and regional government. Creates disconnect between Ec. Dev. or CED and the issues trying to be addressed by existing community groups. Requires a "rockstar" leader employee, which may not be available or committed to a small community. While a Standing Committee is the easiest for one local government to manage, and maintains financial control over funding decisions, it disengages and disempowers community networks and leaders from participating in a Community Team as there is very limited incentive. Instead of the above option, and rather than a Standing Committee, two other types of municipally-sanctioned committees could be created, according to the Community Charter - [SBC 2003] Part 5 Municipal Government and Procedures, Division 4 — Committees, Commissions and Other Bodies. 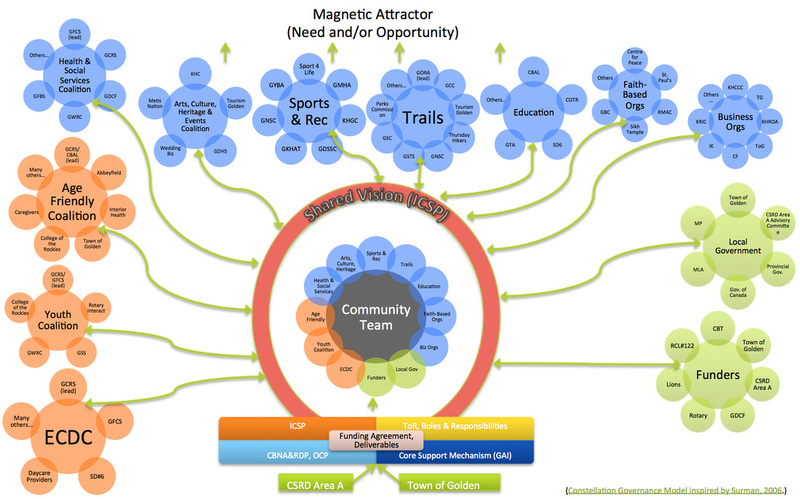 A municipal select committee or commission can be a all-in-one vehicle for a Community Team and a Community Economic Development Office like Figure: GAI 2.2 Concept (below). This will provide the empowerment and responsibility necessary for engagement. To take the concept of responsibility even further, it is fair to introduce the idea of compensating these Community Team members with some form of stipend. Stipends (whether it is with a town Council or credit union Board) provides both incentive and responsibility for the individual to participate and conveys the importance that the community puts on the participants' perspective. Without incentive, there is little possibility of attracting the most qualified, connected, collaborative and community-minded individuals and groups to participate in a Community Team. There is no impetus for a culture change without incentive. Reduces a layer of complexity between resources of local and regional government and community groups. Empowers the Community Team with decision-making and resource-allocation ability. Broad decision-making committee meets the criteria for CBT's Community-Directed Funds Program ($200,000/year). Can absorb the activities of the separate Community Funds Local Select Committee (CFLSC). Greater than the sum of the parts; success not dependent on finding the 'perfect' staff leader. Provides a Stewardship Group to support a community's shared vision with the many individual constellation groups. Does not provide complete oversight by local elected officials, aside from appointments of nominated volunteers. While the above models (GAI 2.1 & 2.2) only represent two Golden & Area A-focused alternates built on the many CED funding models in BC, Surman's Constellation Model and the Jasper Community Team, these can form the basis for future exploration and iterations. The key with sustaining a Community Team - and, arguably, sustained Community Economic Development - is to allow for broad community participation, come up with clear goals, roles & responsibilities and provide the resources necessary to achieve the goals. But this speculation are only ideas. Let's have the politicos create a 'community-minded' framework for the organization and let the Community Team Prototyping activities nail down the details. A new Shared Services Agreement is struck between Town of Golden & CSRD. CSRD Area A's Capacity Building Needs Assessment & Rural Development Plan begins (Jun 2015). The Town of Golden CAO oversees the Agreement (starting June 2015; 3 years minimum duration). A Community Team/Commission is prototyped, created; ToR drafted (Jun – Sept 2015). GAI Staff are hired to both support & lead the Community Team/Commission (Jul 2015). Members are nominated by other groups and appointed by the Local Government(Oct 2015). CSRD Area A's Capacity Building Needs Assessment & Rural Development Plan complete (Nov 2015). 2015/16 Community Work Plan is created (Oct – Dec 2015). Progress is measured and reported quarterly •Annual Plans are created and approved in advance of new fiscal year (each year). The model below provides a detailed representation of the requirements, components and constellations that could exist with the Community Team constellation framework. During a phone call on April 23, 2014, Gary Paget said, "In a small, rural community without many Plans, an ICSP may be a good place to start." To review an example of a ICSP, please see Revelstoke's Plan and process, which has more appendices than can fit on this page. Revelstoke's ICSP was crafted by Mountain Labyrinths Inc., HB Lanarc - Golder and George Penfold, MCIP, with comprehensive guidance from volunteers and elected officials in Revelstoke. CSRD Area A's Capacity Building Needs Assessment and Rural Development Plan (CBNA&RDP) is a totally custom, blueprinting document that has 2 components: the Capacity Building Needs Assessment (CBNA) and the Rural Development Plan (RDP). Initiated in April 2015, the CBNA&RDP "is intended to provide for a process by which all stakeholders look to its future and develop the tools necessary to achieve that future" (CSRD RFP, 2015). It is expected that Area A will have both a CBNA & RDP by November 2015, and will set the vision for the next 10 to 15 years. This will be the first planning document created since the CSRD Area A's "﻿Issue Identification and Planning Education Project﻿" from 2005. While the CBNA&RDP is unique (Hamilton, 2015), similar self-assessment tools are popular in small Saskatchewan, Manitoba and Newfoundland communities - but have not been used in BC before (Paget, 2015). Glen Brown, UBCM General Manager, Victoria Operations, and Meggin Messenger, Intergovernmental Relations and Planning Branch Executive Director, Victoria, would be good resources to learn about other rural community planning tools. It is important to note that needs assessments, by definition look for "problems," compared to asset-based community development frameworks (Porter, 2014). Professional work is based on ToRs. The Town of Golden has a ToR for each committee. Here is an example from the CBT Funds Local Select Committee (CFLSC). Funding Agreements, like Golden & Area A's tripartite agreement for Community Economic Development Services, forms part of the foundation for collaborative intiatives (GAI) and other shared services. GAI's Constitution and Bylaws are attached below and could be updated in a new reiteration. Imperatives for CED in Golden were shared with the Town's Economic Development Services Vision Committee by Jon Wilsgard in 2013. It is becoming increasingly clear from the repeated hesitancy to delegate responsibility for the distribution of public funds that a 3rd option may be the only alternative for Community Team existence. There appears to be no urgency with setting up a CED function in Golden & Area A. This leaves a Community Team with no resources to consult with the local groups and residents and no funding designated for them to allocate. Therefore, a much smaller first step may be the only possibility. That first step can be the alignment of the Town of Golden's Community Funds Local Select Committee (CFLSC), which is responsible solely for the intake, adjudication and awarding of the ~$268,000 in CBT Community Initiatives & Affected Areas Program (CIP/AAP), with the fledgling Community Team. This option benefits from opportune timing. 2015 is the last year for the current 5-year CBT CIP/AAP contract with the Town of Golden as a designated Delivery Partner. Summer 2015 is a great time to devise and equip a Community Team to take on the CBT CIP/AAP process. In fact, some of the members of the CFLSC could be well-suited to serve on the Community Team, ensure continuity. Over time, and as the local and regional politicians grow confident in the capabilities of the Community Team, more responsibility can be offered to them or they can be requested to advise on other opportunities, such as the CBT Community-Directed Funds ($200,000/yr), Economic Opportunity Funds program, PILT and grants in aid from both local and regional governments. In a short amount of time, the Community Team could be empowered to direct ~$500,000 each year.